She is a proud big sister. And on Monday, Chrissy Teigen shared a cute snap of daughter Luna attempting to give her newborn brother his pacifier. 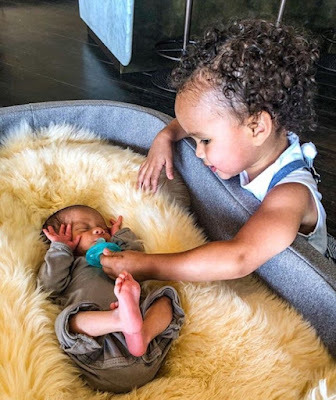 The sweet bonding moment, which was shared to Instagram, was taken by John Legend's brother, Ron Stephens. Chrissy, 32, styled Luna in a white, sleeveless top and what appeared to be overalls. Meanwhile, little Miles rested comfortably in a gray onsie. The proud mom simply captioned the photo with a heart.